Do you remember Lip Smackers? Remember buying them because they smelled so delicious? Personally, I was all about that Dr. Pepper lip balm. Sure, Lip Smackers are still around but at the age of 25 I've kind of outgrown those trendy lip balms in favor of ones that actually help my lips, but I'm still not over requiring them to smell delicious. Lucky for me mouthwatering lip balms do exist and are made by a friend of mine. 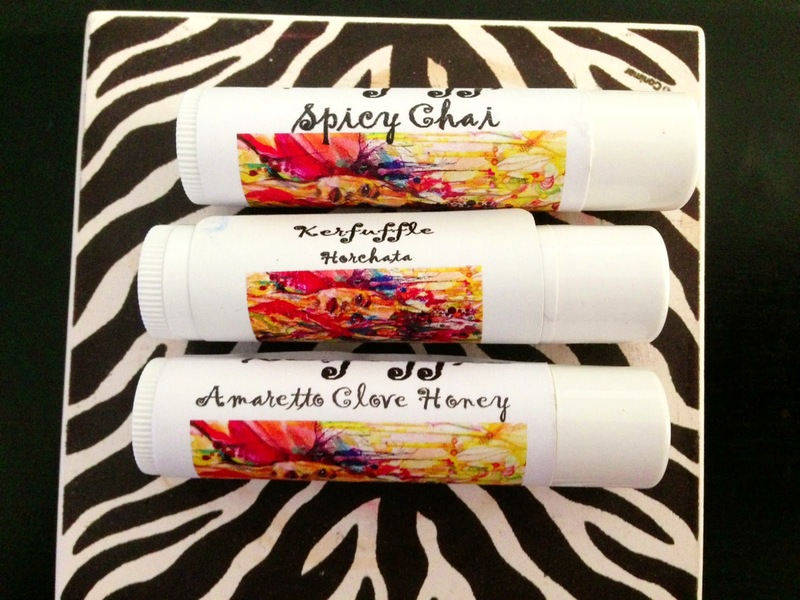 Kerfuffle Lip Balms is the name and lip balms are the game. Created by Elise Caloca, these lip balms are handmade with all natural ingredients like coconut oil, bees wax, organic shea butter, organic cocoa butter, vitamin e, olive oil, so not only do they smell incredible they're actually great for keeping your lips ultra kissable! Elise even uses real chocolate in some of her flavors so you'll also get a natural beige sheen. She sent me three wonderful flavors to try: Spicy Chai, Horchata and Amaretto Clove Honey. Spicy Chai: Immediately you get a whiff of chai that reminds me of my favorite Starbucks drink. About 2 minutes after I used the Spicy Chai my lips got all tingly, not in a bad way but similar to those $18 lip plumper lip glosses. Fun fact, cinnamon is a natural lip plumper so this lip balm not only moisturizes but gives your lips some extra oomph! Horchata: This one smelled less spicy but still sweet. Perfectly cinnamon-y this flavor reminded me more of snickerdoodles then Horchata but to be fair, they both have the same flavor profiles. Plus, where else are you going to find Horchata lip balm? 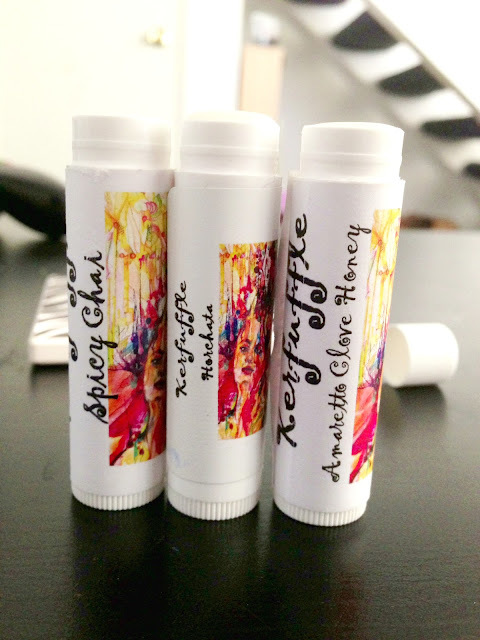 Amaretto Clove Honey: When I first smelled this flavor it reminded me of almond extract. That sweet almost cherry aroma but less intense when paired with the sweet smell of honey. This flavor wasn't overly sweet, it was actually almost a calming aroma, the best way to describe it would be warm. All the lip balms look just like the chapstick you would buy at Target but with a cuter label and much better flavors. These aren't meant to be a dessert you taste on your lips all day, they were intended to keep your lips soft and moisturized. Other flavors include: Orange Sangria, Chocolate Banana Coconut Vanilla, Mango Lassi and Banana Coconut. To try Kerfuffle Lip Balms for yourself head on over to their Etsy shop! These are a foodie dream come true! The flavor combinations not only inspire soft lips but new baking ideas..